The Massachusetts wine industry is a relative newcomer to the national wine scene - the state's first winery of the modern era opened in 1971. Massachusetts boasts only about 30 wineries, but they are making a name for themselves. Several folks who know a lot more about Massachusetts wine than I do have told me it's high time that wine from the Bay State got its due. The grapes you'll find growing in Massachusetts are likely to be Chardonnay, Pinot Noir, Riesling, Gewurztraminer, Pinot Blanc or Pinot Gris. They are also growing some American hybrids like Vidal Blanc and Cayuga. Wine made from fruit other than grapes is also in the picture, and mead - wine made from honey - figures in to the winescape. Wine Country has already visited Massachusetts - Cape Cod Winery - which gave us a chance to try a wine made from hybrid grapes. This time, we taste some more traditional winemaking grapes. 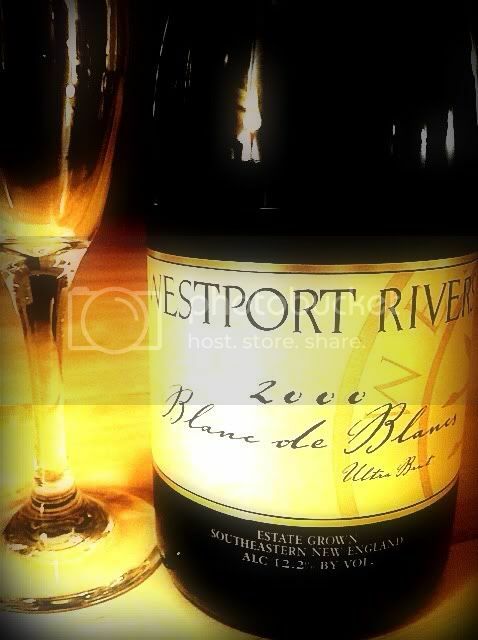 Westport Rivers is a small, family-owned farm in Westport, Massachusetts which has been growing grapes and making wine for 25 years. Over that time they have racked up a lot of gold medals and good press, but they are most proud of the fact that their wine has been served in the White House under two administrations. New England AVA, where most of the Massachusetts wineries are located. They are also a member of the Coastal Wine Trail of Southeastern New England. Westport Rivers Pinot Gris 2009 - After harvest they let the grapes sit in the press for a few hours before pressing, to give the wine some color and aromatics from the skins. It works! The wine has a great golden tint and the nose is bouquet of flowers - a big bouquet. There's also a touch of minerality in the aromas which comes across more like a gentle earthiness. The palate plays peaches against melons with a lovely herbal quality rising along with some acidity to keep things food friendly. 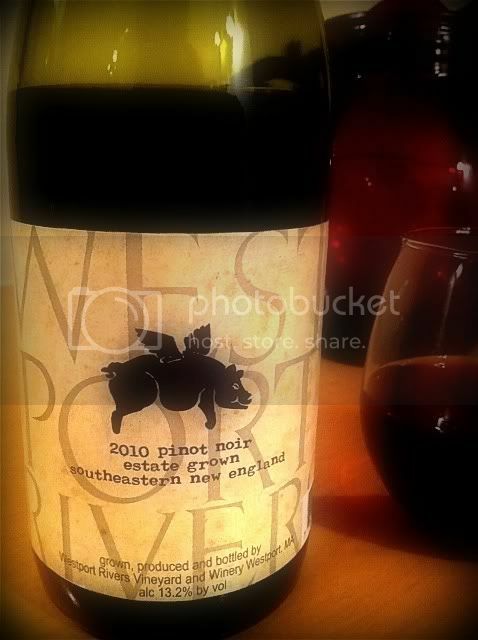 Westport Rivers Pinot Noir 2010 - At 13.2% abv, this is much more old world than new. Medium ruby in color, the nose on this Pinot Noir shows muted raspberry and a strong herbal aroma that smacks of greenness. It's nothing like a whiff of high octane Cali Pinot, that's for sure. The palate shows that same herbal edge, reminiscent of Cabernet Franc, and it weighs in nearly equally with the red plum and sour cherry flavors. The minerality is strong, the acidity lip smacking. It's herbaceousness and acidity show that the winemakers were thinking of the state's seafood bounty when they crafted this one. 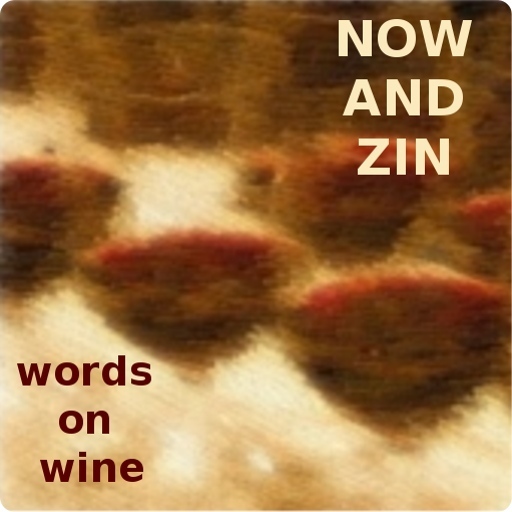 It's a light, even delicate, framework for a wine that's more about feel than flavor. 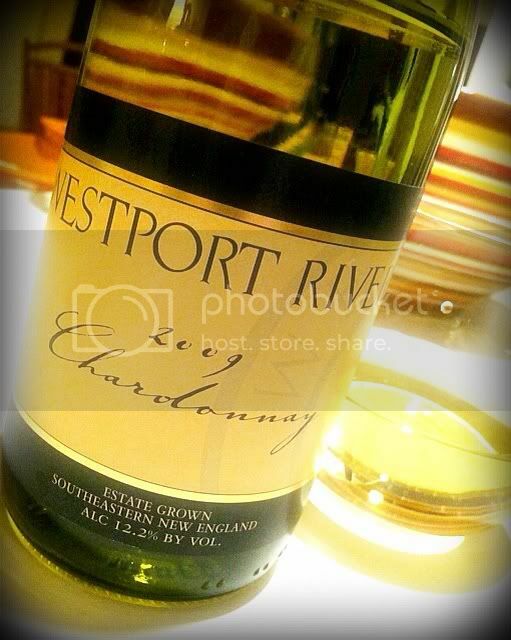 Westport Rivers Chardonnay 2009 - 100% estate-grown Chardonnay, this wine is 80% aged in French oak, sur-lie. Letting wine rest on the dead yeast during fermentation imparts a richer, fuller feeling. That does not come at the expense of acidity, though - there’s plenty of acid to tingle the taste buds. Big tropical aromas and spices dominate the nose, while the palate also gets the palm-tree treatment - there are traces of pineapple, guava, banana and even a little coconut in the flavor profile. There's also a trace of lemon peel and even a ginger-like quality that flirts on the palate. That earthy minerality shows up here, too, as it did in in Pinot Gris. It's quite a complex little Chardonnay, and - once again - not very California. A 12.2% abv number makes for a very drinkable wine. 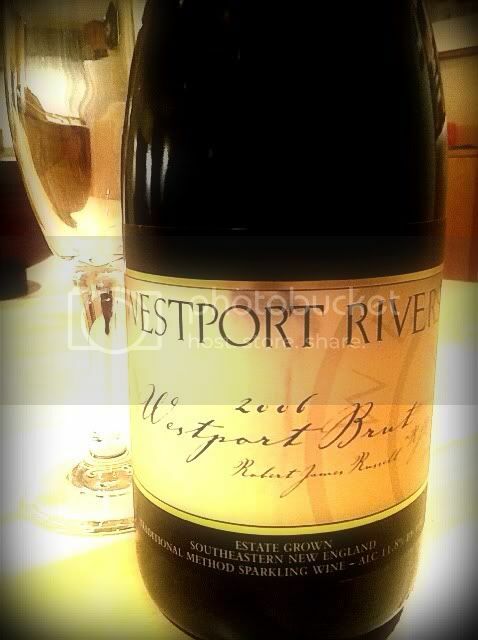 Westport Brut RJR 2006 - A traditional method sparkler comprised of 65% Pinot Noir grapes and 35% Chardonnay, the Brut has a light golden hue. The frothy head dissipates quickly. Its nose reminds me of earthy peaches, very ripe. I swear I smell mayhaw jelly. On the palate there's a distinct banana flavor and a toastiness with that earthy quality. A light mouthfeel and a lingering sense of banana candy give me plenty to ponder while sipping. This is a singular sparkler in my tasting experience. It's fascinating. 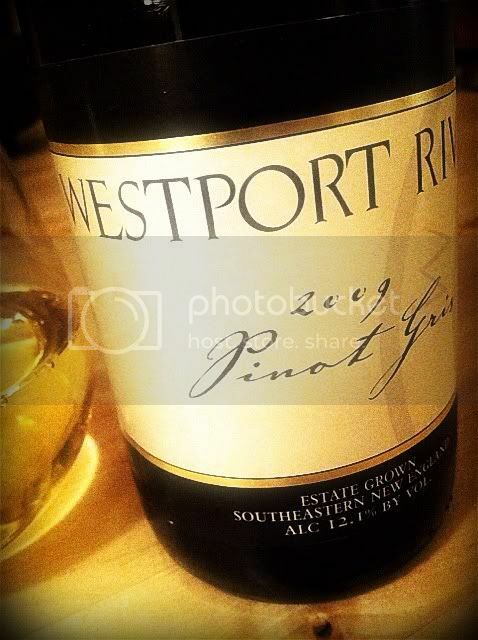 By the way, RJR stands for Robert James Russell, Westport Rivers' winemaker. Blanc de Blancs Ultra Brut 2000- This yellow-gold sparkler offers one of the most pungent noses I've ever experienced in a sparkling wine. The tropical aromas I found in the Chardonnay are here, along with a heaping helping of toasty earthiness. The Blanc de Blancs is made from 100% Chardonnay grapes and is aged over seven years before finishing. The palate is rich and citrusy, with plenty of bubbles and a bracing acidity. There's a very intense nutty quality i find fascinating It does wonders for a handful of peanuts! The winery recommends you pair it with oysters, and that would seem to be an even better choice. 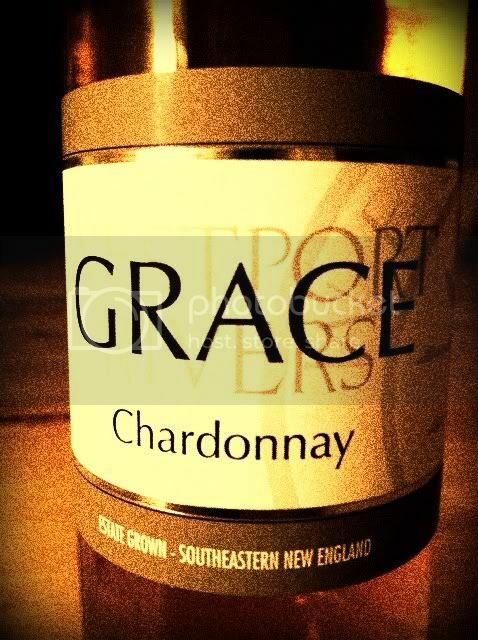 vintages and you've got Grace. It has an alcohol content of 17.5% abv, so you'll want to go easy on it before operating heavy machinery. This wine looks terrific in the glass. It's a rich shade tending towards amber, almost like bourbon. Gorgeous aromas of caramel and honey just about knock me off my feet. The palate is awash with flavors of lemon peel drenched in dark honey. After regaining consciousness, I realize what great acidity this wine has - feel free to bring on the fattiest cheese and pâté for it. The one thing that keeps appearing in the wines of Westport Rivers is the amazing terroir, the sense of earth that permeates each of the wines I tried. 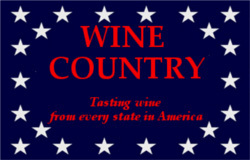 It marks each wine as a distinctive representative of Wine Country Massachusetts.